Another visit to a local mineral show had me squeaking with glee after finding some ammonites species I hadn't previously seen. It was awesome! The journey there and back however wasn't so awesome. We took the bikes and within about an hour the sun disappeared behind the clouds. Needless to say it was a very cold ride and even though I was ridiculously bundled up under my suit, my toes, arms, and chest got chilled! I am definitely investing in a heated vest if I am going to go on these late season rides. If I didn't have heated grips it'd be unbearable. Could have only been worse if it snowed. But I survived and added a few more ammonites to the collection! Yay! 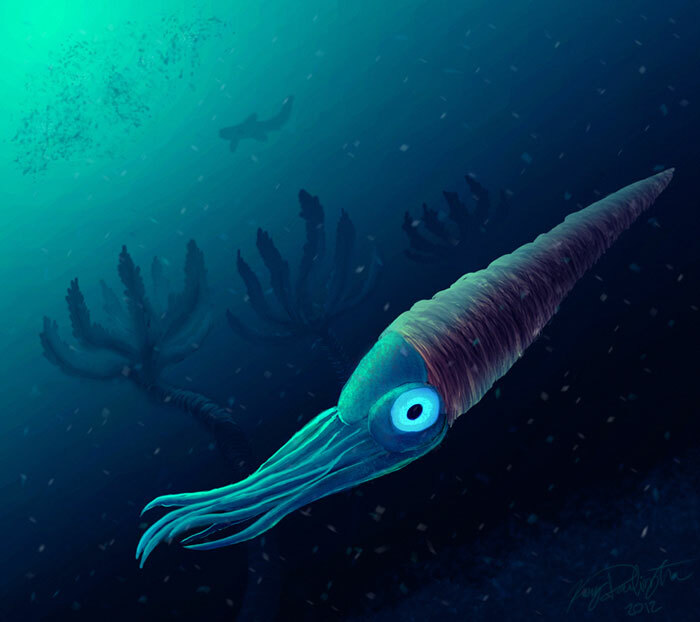 "Hi I'm a hypothetical Kosmoceras!" The prehistoric squid with a shell! "I am cute AND deadly! ...but mostly cute." After watching this I have decided I am more afraid of squid than any kind of shark any day. Fascinating creatures but the intro made me lol so hard... "alien creatures!" and then the red neck fisherman came in... "Yeehaw I caught me a jumbo squid! Now how do I eat it?" Awesome. Long time no update, I know. Lots of stress in life suddenly gone so that leaves more room for art! Yay! Went to the local gem and mineral show and brought home a few good finds. I am slightly obsessed with ammonites. I know they are one of the most common fossils out there but they are also some of the prettiest when polished. And a dragoness likes her pretties. The one I picked up had a lot of red iridescence in it despite being sold as just a regular ammonite. I just love it so much! 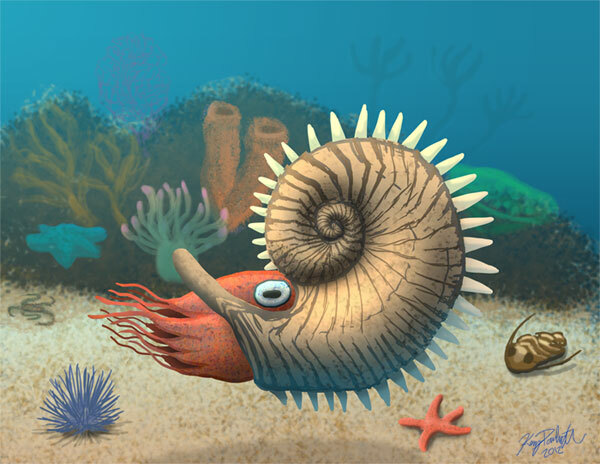 My head just swims with what these prehistoric cephalopods looked like! A lot of images out there have them looking like our modern day throwback the nautilus. 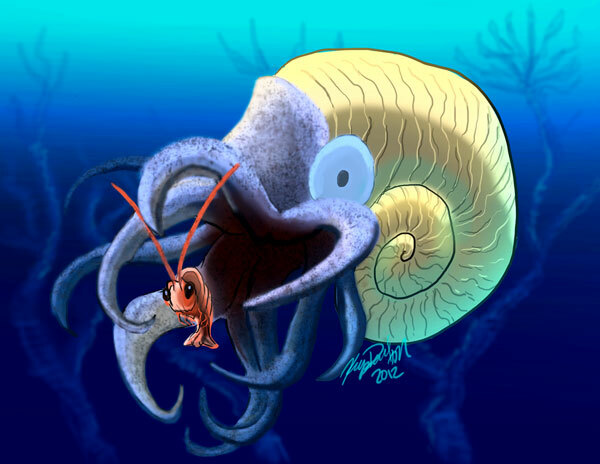 Following that theme I bring you a theoretical ammonite! There's all sorts of these creatures! Straight ones and partially uncoiled ones. It gets pretty weird. I wonder what they all looked like and what they ate. I searched the internets for any kind of preserved soft body tissue fossil but so far I haven't found any hints to what their squishy parts really looked like! All that gets preserved is their shells. So really, the sky is the limit, or in this case, the imagination! Losing steam on this one... added more details and fixed a slew of proportion issues. White on white wasn't working, neither was the dramatic idea of having Altaïr fending off an axe with his arm guard. Going for a surprise stabby stabby instead. At last, after a good glitzing this quick sketch is complete. 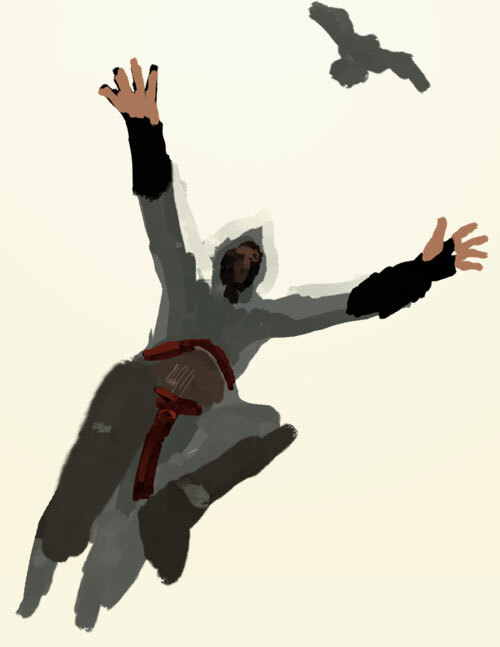 I remembered at the last minute that Altaïr has a nub for a ring finger, apologies. Also, I found the first game to overuse the bloom effects so in an effort to stay true to the game's glowing atmosphere I present over used color-dodgy-ness! Desert sun will melt your eyes don't ya know!! 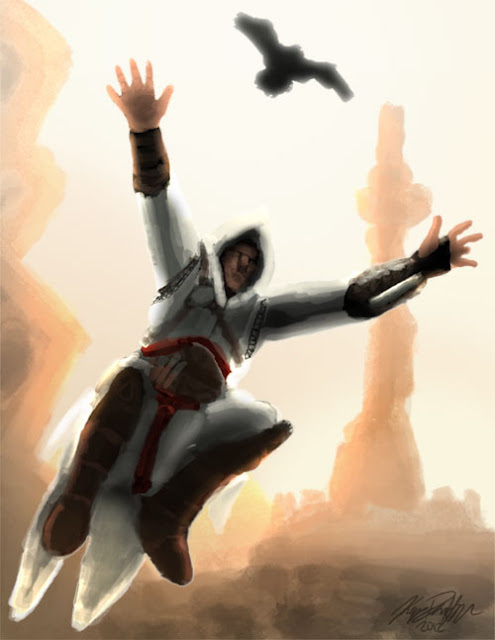 Altaïr, master assassin and badass extraordinaire. Okay I know I am late on all things gaming but wow. Seriously wow. It's been a long time since I have enjoyed a game just as much as the Blood Omen and Soul Reaver Saga. Legacy of Kain was the culmination of these two games and it was dripping with awesome. Now it's Assassin's Creed. The first game was clunky and rigidly structured with a storytelling that was kind of bland not helped at all by Altaïr's terrible deadpan voice actor with an American accent in a Middle East body. It just didn't make any sense to me and grated on my brain so hard I put the game down when I went to the first city of Damascus. I hated this game! 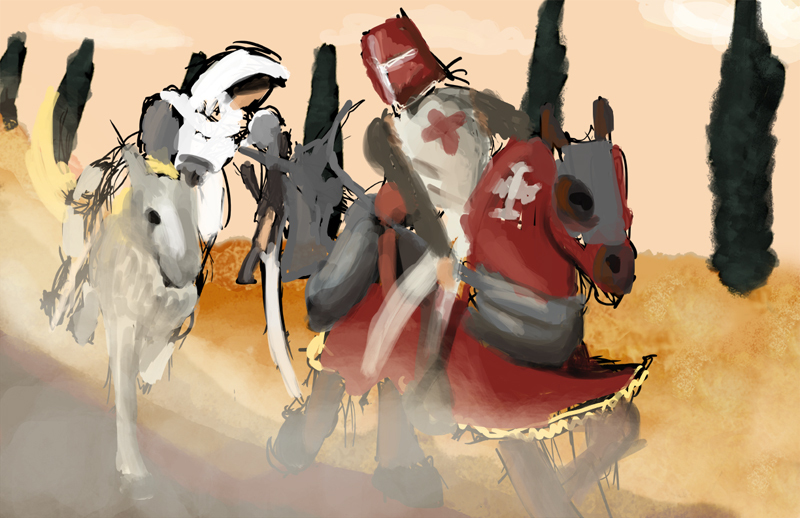 I sucked at it so terribly in every aspect: combat, remaining anonymous, riding the horse. Even the horse's animation bothered me. Something about it just wasn't right and coming from Red Dead Redemption the Assassin's Creed horse was downright terrible! Why does a horse matter to me so much? Because I am a girl and I like horses. There I admitted it. I picked up the game for a second time months later and suddenly these little nuances didn't seem so glaring. It wasn't an amazing game, dragged on with the 'go to view point do side mission', I still sucked at the combat (going through the last parts leading up to the game's ending took me hours and was harder for me than any of the previous missions all combined!) but I liked the game enough despite Altaïr's mastery at stating the obvious. Perhaps he'd be better off being a silent protagonist? 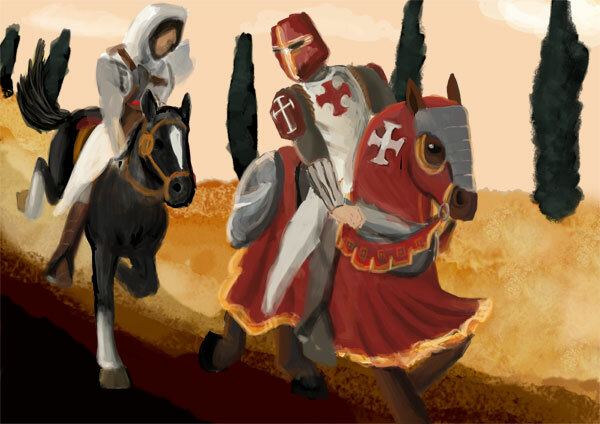 And everything changed for the better in Assassin's Creed 2. Everything became much more rich! Suddenly there were facial expressions! No more deadpan doll faces! The story was presented and progressed in a more cinematic way! I started rooting for Desmond to escape, and he seemed engaged in what was going on around him instead of being so aloof and asking all the noob questions as a TOOL to explain things to the player. The Assassin chosen for this game, Ezio, opened with so much character and a personality that grew with ambitions that the player could really connect with. While there was still an evil plot to uncover it wasn't orchestrated by being forced to listen to your target drone on about how their beliefs were just and virtuous and quite frankly insane. The game made me love it even more and had me laughing here and there with Ezio's antics and it even made me feel guilty for dispatching guards that sighted me on rooftops. I realized they were innocents just doing their job but sadly it was simply easier to kill them than to avoid them. Whereas with Altaïr, the unstoppable force, I didn't feel as guilty since the guards were presented as mostly being corrupt (save the citizen missions). Oh well, they were only pixels after all. I love this game series and I am totally hooked! The last shadow you'll ever see! Welcome to Paperglitch! Here be dragons! This is just a repository for random sketches, works in progress, and whatever else comes to mind. Eventually there will be a portfolio somewhere when Skyrim isn't eating my brain.